Migrants wait to disembark from the Spanish Guardia Civil Rio Segura Patrol Ship with 1216 migrants onboard including 256 children and 11 pregnant women, who were rescued in the Mediterranean sea in Salerno, Southern Italy on June 29, 2017. 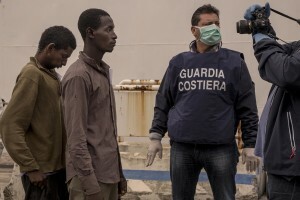 A migrant destroyed by fatigue after the arrive of the tanker “Chimera” with 545 immigrants in Salerno port on April 21, 2015. 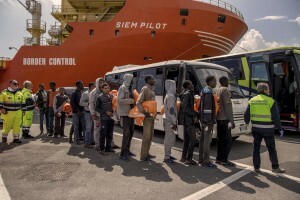 More than 500 migrants were rescued from the waters of the Mediterranean Sea in the last days. 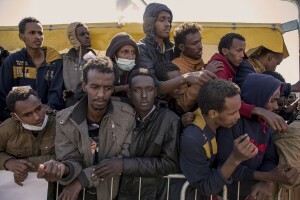 Migrants wait to disembark from the Aquarius rescue ship run by NGO S.O.S. Mediterranee and Medecins Sans Frontieres at Salerno harbour on May 26 2017. More than 1000 migrants including 240 children disembark from the Aquarius today. 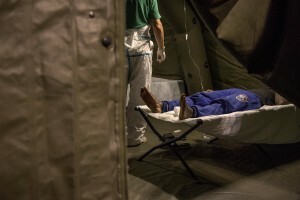 A doctor of Italian Red cross visits a migrant after the arrival of the Norwegian ship “Siem Pilot Stavanger” with 810 refugees at Manfredi pier of Salerno port in Salerno on August 2, 2016. 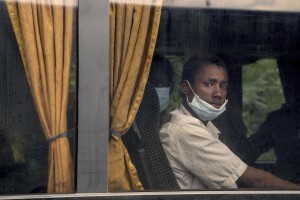 The ship carrying migrants coming mostly from Sudan, Nigeria, Syria and Egypt. 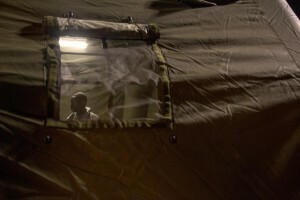 A migrant in poor health is seen inside a tent of Italian Red cross after the arrival of the Norwegian ship “Siem Pilot Stavanger” with 810 refugees at Manfredi pier of Salerno port in Salerno on August 2, 2016. 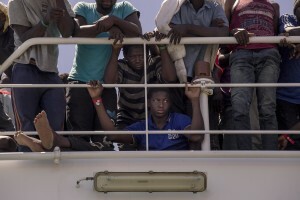 The ship carrying migrants coming mostly from Sudan, Nigeria, Syria and Egypt. 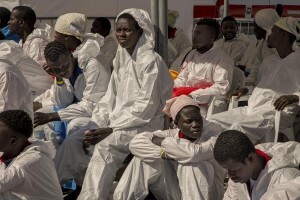 SALERNO, ITALY – MAY 26: Migrants affected by scabies are seen at Manfredi pier of Salerno port after the arrival of the Aquarius rescue ship run by NGO S.O.S. Mediterranee and Medecins Sans Frontieres on May 26 2017. More than 1000 migrants including 240 children disembark from the Aquarius today. The Norwegian ship “Siem Pilot Stavanger” arrives at Manfredi pier of Salerno port in Salerno on April 1, 2016. 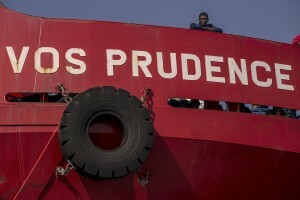 The ship carrying 545 refugees coming mostly from Syria, Eritrea, Sudan, Nigeria and Egypt. 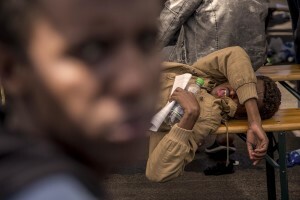 SALERNO, ITALY – MAY 26: Migrants wait to disembark from the Aquarius rescue ship run by NGO S.O.S. Mediterranee and Medecins Sans Frontieres at Salerno harbour on May 26 2017. More than 1000 migrants including 240 children disembark from the Aquarius today. 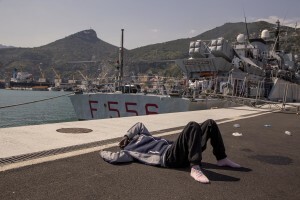 A migrant waits to disembark from the Italian rescue ship Vos Prudence run by NGO Medecins Sans Frontieres (MSF) arrived with 935 migrants on board in the port of Salerno, southern Italy on July 14, 2017. Refugees are seen after the arrival of the Coast Guard ship “Bruno Gregoretti” at Naples harbour on October 23, 2016. 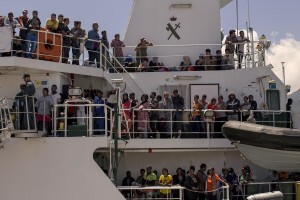 The 466 refugees on the ship were mostly from Nigeria, Eritrea, Gambia, Pakistan and Bangladesh. 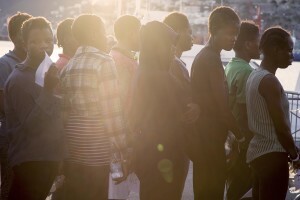 Migrants expect to receive a meal after the arrive of the tanker “Chimera” with 545 immigrants in Salerno port on April 21, 2015. 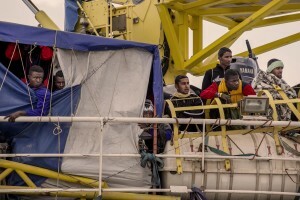 More than 500 migrants were rescued from the waters of the Mediterranean Sea in the last days. 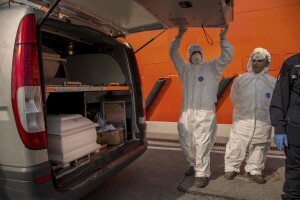 The coffin containing the dead body of a three years old child is seen after the arrival of the Siem Pilot ship with about 900 migrants in the port of Salerno, Italy on May 9, 2017. 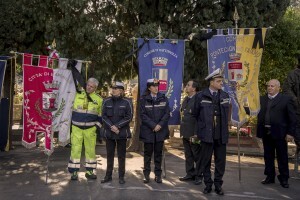 Policemen are seen during the funerals of 26 teenage migrant women found dead in the Mediterranean sea in early November, during the inter religious funeral service at the cemetery of Salerno, southern Italy on November 17, 2017. The bodies of the victims were found floating in the water by Cantabria Spanish ship last November 5. Migrants are seen after the arrival of the Norvegian border patrol ship Siem Pilot at Salerno harbour on October 5, 2016. 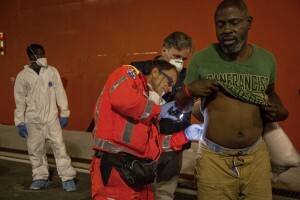 Migrants on the ship were mostly from Nigeria, Gambia, Eritrea, Pakistan and Guinea. The Siem Pilot ship with about 900 migrants arrives in the port of Salerno, Italy on May 9, 2017. 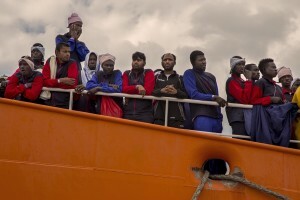 The tanker “Virginio Fasan” with 877 immigrants, including 149 minors, is arrived in Naples port on September 10, 2014. 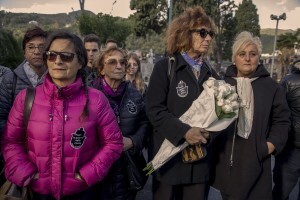 Italian citizens take part in funerals of 26 teenage migrant women found dead in the Mediterranean sea in early November, during the inter religious funeral service at the cemetery of Salerno, southern Italy on November 17, 2017. The bodies of the victims were found floating in the water by Cantabria Spanish ship last November 5. 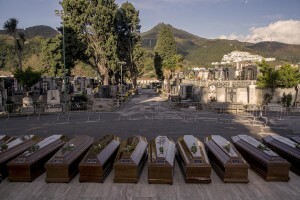 The coffins of 26 teenage migrant women found dead in the Mediterranean sea in early November, during the inter religious funeral service at the cemetery of Salerno, southern Italy on November 17, 2017. The bodies of the victims were found floating in the water by Cantabria Spanish ship last November 5.